FORTA® MOBILE-MESH™ is an alkali resistant glass fiber developed for modification and reinforcement of cement based applications to ensure increased long-term performance and durability. MOBILE-MESH will not rot or corrode and is unaffected by UV radiation, making it suitable for use with minimal cover. concrete application. FORTA MOBILE-MESH rovings have a high Elastic Modulus and Tensile Strength, making it ideal as an effective reinforcement for any glass reinforced concrete project. FORTA MOBILE-MESH can be easily added into a volumetric ready mix concrete truck with the help of a FORTA® patented fiber dispenser. This process requires no extensive equipment changes – making it a simple and easy investment to add long-term value to your concrete. product is in use. Rovings are packed on pallets either with or without boxes. FORTA MOBILE-MESH rovings should be stored away from heat and moisture and in their original packaging. Optimum conditions are temperatures between 15 and 35°C (60 and 95°F) and humidity between 35% and 65%. If the product is stored at lower temperatures it is advisable to condition it at working temperature for at least 24 hours before use, to prevent condensation. 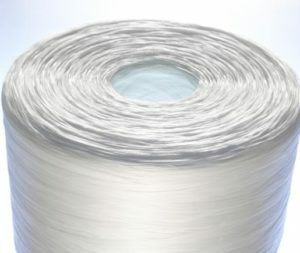 * Our fibers are manufactured with high Zirconium content in compliance with ASTM C1666/C1666/M-07 and EN 15422. and under the recommendation of PCI and GRCA.